On the way home from the beach yesterday I consumed a quarter of a sriracha bagel (my new favorite), one Boston cream donut, a meal from Chick-Fil-A and four peanut butter crackers. I told myself I would make dinner when we got home. Except…we had no food. And after spending wayyyy longer in the car than we should have, I was not about to head to the store. So, we got Subway. And then we each had an apple fritter for dessert. And I finished another quarter of sriracha bagel. OH FOR THE LOVE OF CARBS! I woke up this morning determined to get back on track with my eating. I scarfed down two scrambled eggs and spent the morning recipe-searching and grocery shopping. We loved both of the recipes I tried today—chicken salad for lunch and shrimp tacos for dinner. (I didn’t make side dishes for either.) I have a feeling I’ll be making both of them a lot this summer! Click on the recipe title to view the original recipe. Combine first 8 ingredients, then toss with chicken to coat. We at it plain, but the recipe suggests serving it with pita chips. We loved it just how I made it, but I bet feta would be yummy in there (and maybe black olives, too). I’m also tempted to serve it in lettuce cups next time! 2. Combine the salsa ingredients in a separate bowl. 4. If you like, chop the shrimp into bite-size pieces. Add shrimp to marinade. 5. If you like, heat tortillas over the stove. 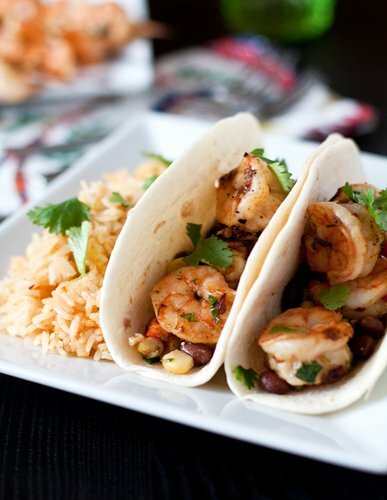 Spread sour cream down the middle of each tortilla and top with the salsa and then the sauce-covered shrimp. *You’ll have leftover chipotle peppers in adobo sauce. They’ll keep in the fridge for a week or two. If you don’t plan on using your leftover peppers anytime soon, freeze them in ice cube trays or in a freezer bag.